The first thing to do is lay out your garden — you can’t set up all your plants without having something to place them on. For some gardens, the layout is a simple patch of grass; other gardens may be a little more elaborate and use grass platforms connected with ladders or bridges. Place patches of dirt where you want your greenery to be located. Normally, you can’t pick up grass blocks, so you have to place dirt blocks and then grow grass over them. However, if you have a lot of expendable resources, you can use the Silk Touch enchantment to obtain grass blocks directly. Construct borders, bridges, ladders, water, and anything else that isn’t a plant of some kind. Build these items early on so that you don’t discover complications later. 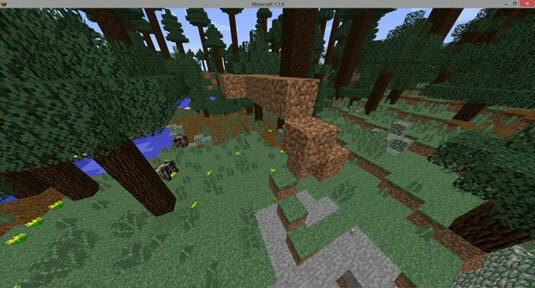 Use more dirt blocks to connect all patches of land with nearby grass. As long as your grass has enough light, it spreads into your garden. Watching grass grow is exactly as boring as it sounds; work on other tasks while you wait for your garden to become green. Destroy all excess dirt or grass blocks. When this step is done, you’re ready to start planting. Decide how much color you want in your garden. Some people like gardens that are mostly green, with small bits of color here and there. Others like bright and vibrant colors everywhere. The color options are completely up to you. Just be sure to make your decision before you move to Step 2. Choose the plants you want to use. Pick colors and shapes that go well together but don’t overload your garden with too many different types of plants. Decide where to place all your tall plants. This decision includes cacti, trees, sugar canes, and tall flowers such as peonies. Keep in mind that you can’t see shorter plants if they’re obscured by too many tall ones. Decide which sections should have no plants. You don’t have to cover every single grass block with plants — always leave some room to walk around. You can even add a gravel road or two. After you know which spots you want to remain empty, you’ll know where to place all the other plants you want to add. Place all your small, colorful plants. Arrange these elements however you like — you can easily change them later. Fill the rest of the unused space with green plants. 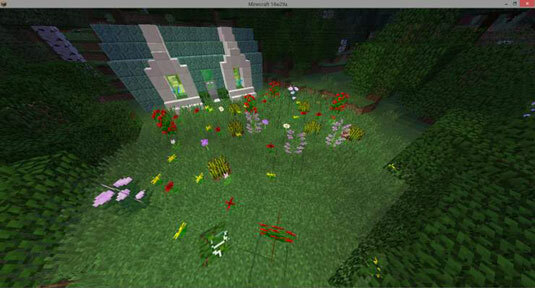 Items such as ferns and tall grass work well for filling in gaps. Be sure not to fill in any areas you want to keep clear for paths or roads. Acquire the appropriate equipment to till the ground (making a hoe is helpful). Have a water source nearby to properly nourish plants. Use torches or other sources to add light to the garden at night time. Enjoy assembling your garden and continue to expand its presence and utility by adding new plants, designs, and corresponding structures like fountains!